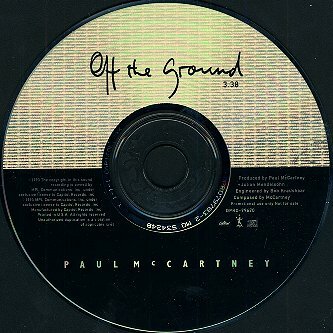 Detail : This CD was released ONLY in the United States and has ONLY the single track of "Off The Ground" on it. Additional production and remix by Keith "KC" Cohen assisted by Tom Daugherty and Ulrich Wild at Larrabee West Sound Studios. Additional programming: Tom Daugherty. For promotional use only/Not for sale. This CD version lasts exactly the same length as the album, at 3 minutes 38 seconds. This remix is VERY good, and is a definate improvement on the album track. The sound is much crisper, with not so much reverb on Paul's lead vocal. The album version vocals come in on the sixth bar, whereas this CD remix has an extra four bars beforehand with the la-la-la-la-la-la-la's that feature later in the song spliced to the start. Hence the lead vocal comes in on the tenth bar. 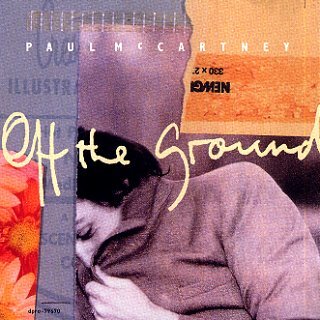 At the end of the song, the last sung refrain is "Off The Ground", which on the album is followed with four bars of hand-clapping music plus three un-backed hand-claps. Here on this remixed CD, the song immediately fades and concludes on the last beat of the vocal. The sleeve is by Assorted Images. Also see the U.S. 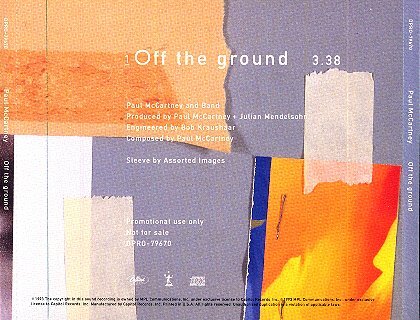 Import single of Off The Ground.